You have no idea how happy I am to have a copy of this will! Peter Carrico is my 5th great-grandfather. My mother was a Carrico and her line goes directly back to Peter through her father. Through her mother’s line she is also descended from Peter Carrico – Martha Ann Carrico (a descendant of Peter) married William Peter Montgomery in 1862, making Peter Carrico also my 6th great-grandfather. 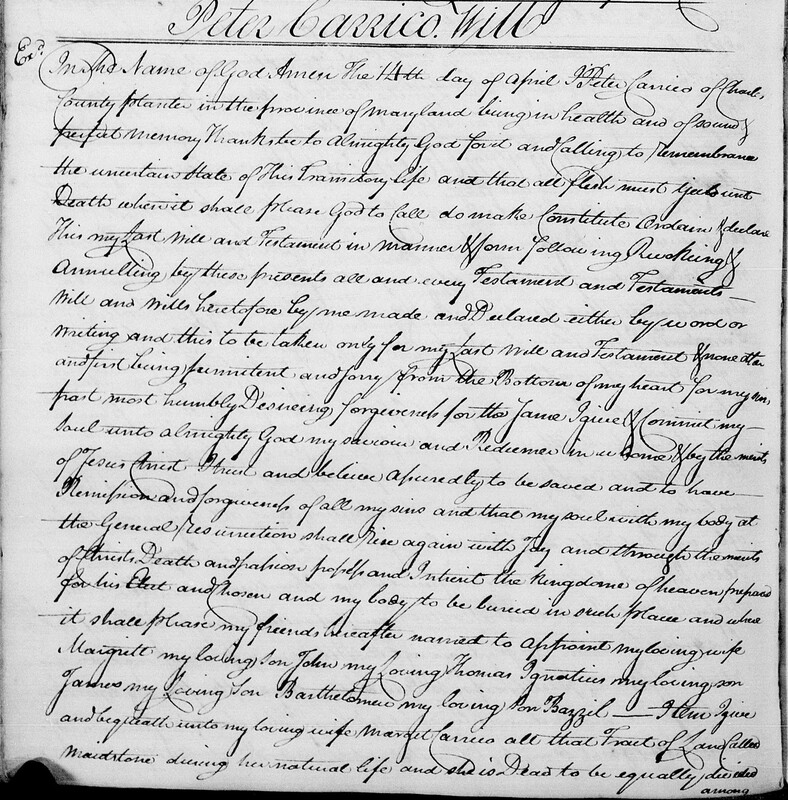 Notice the large name of the deceased above the will – and the county written at the top of the page. Very easy to find a particular will. In the name of God, Amen. The 14th day of April, I, Peter Carrico, of Charles County, planter, in the province of Maryland, being in health and of sound and perfect memory, thanks be to almighty God for it, and calling to remembrance the uncertain state of this transitory life and that all flesh must yield unto death when it shall please God to call, do make, constitute, ordain and declare this my last will and testament in manner and form following, revoking and annulling by these presents all and every testament and testaments, will and wills, heretofore by me made and declared either by word or writing and this to be taken only for my last will and testament and none other, and first being penitent and sorry, from the bottom of my heart for my sins past, most humbly desiring forgiveness for the same, I give and commit my soul unto almighty God, my savior and redeemer in atone and by the merits of Jesus Christ, I trust and believe assuredly to be saved, and to have redemption and forgiveness of all my sins and that my soul, with my body at the general resurrection shall rise again, with joy and through the merits of Christ’s death and possess and inherit the kingdom of heaven prepared for his elect and chosen, and my body to be buried in such place and where it shall please my friends, hereafter named, to appoint my loving wife Margaret, my loving son John, my loving son Thomas Ignatius, my loving son James, my loving son Bartholomew, my loving son Bazil. My four sons, that is to say, John, Thomas Ignatius and Bartholomew and Bazil. Item. I give and bequeath to my loving wife Margaret a tract of land called Carrico’s Hope during her natural life and when she is dead to my loving son James. In witness herein I have set my hand and fixed my seal this 14th day of April in the year of our Lord 1764. On the back of the foregoing will was endorsed. Charles County 18th October 1765, came John Yates and made oath on the holy Evangelists of Almighty God that he saw Peter Carrico, the testator, sign and seal the within will and heard him publish and desire it to be his last will and testament and that at the time of his so doing was, to the best of his apprehension, of sound and disposing mind and memory and that he, together with James Armstrong, the other witness severally subscribed as witnesses to the said will in the presence of the testator and at his request. You found a treasure!! Thank you for sharing!! Thanks for the Will, not sure how? 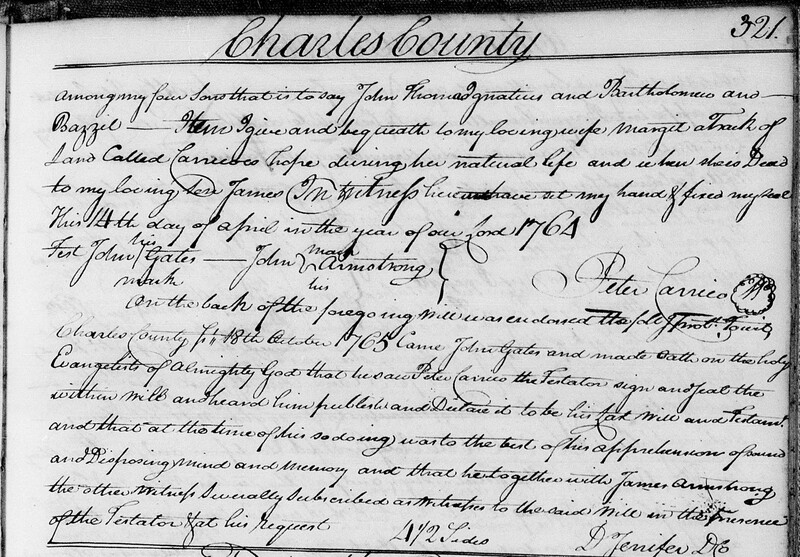 But Mary Carrico of Charles CO MD was my 5th Grt Grandmother, she married Benjamin Harrison Kerrick. I think Mary was born in 1770-72 and BHK was born in 1765 everyone says. Both from Charles Co MD. The moved after BHK was in the Rev war in to Washington CO MD and them to Spencer CO KY in 1800. Mary died before 1830 and BHK married Teresa Carrico Rogers. BHK and Mary are buried in St. Benedicts Cem. in Taylorville KY, he died in 1838.